English: Common, Eurasian chiffchaff; French: Pouillot véloce; German: Zilpzalp; Spanish: Mosquitero Común. 3.9-4.3 in (10-11 cm); 0.2-0.4 oz (6-12 g). Small warbler with short, fine bill, olive-green upperparts, white underparts, brownish flanks, a dark line through the eye, surmounted by a light line. 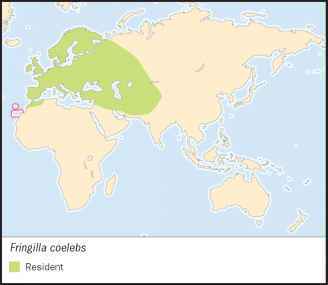 Breeds from Iberia, British Isles and Scandinavia to Caspian Sea, northern Mongolia, eastern Siberia. Winters in Western Europe, Mediterranean, northwest Africa, Middle East, India and sub-Saharan Africa. Open woodland with tall undergrowth, parks, and scrub, typically in lowlands. Solitary or in pairs during breeding season. In small groups or mixed flocks in migration and winter. Territorial. Song highly variable; in nominate group it is series of two-note alternating phrases. Forages from ground to canopy for insects, gleaning from foliage. nestlings cared by female; fledge after 14-16 days. Brood independent after 10-19 days.